Made from Alpaca,this bags are very resistent to carry your clothes and handcrafts, perfect for outdoor,picnics. Are big enough to carry more than you imagine. Free Shipping Worldwide. Whether you're going around the corner or around the world on your next trip, you're going to need a travel bag. This is a very special handmade purse of high quality at low price. Beautiful Alpaca Travel bag medium AMAUTA brown. Whether you're going around the corner or around the world on your next trip, you're going to need a travel bag. What is a travel bag? A travel bag is light. A travel bag is small enough to carry aboard an airplane but big enough to accommodate your most important stuff. A travel bag is soft. A travel bag can be slung over your shoulder or grabbed by handles. This Big Alpaca Travel Bag Tambo earth is high quality at low price, and the best is free shipping .You can start collecting the Incastreasures Travel bags.We will add a free gift with your Big Alpaca Travel Bag Tambo earth. 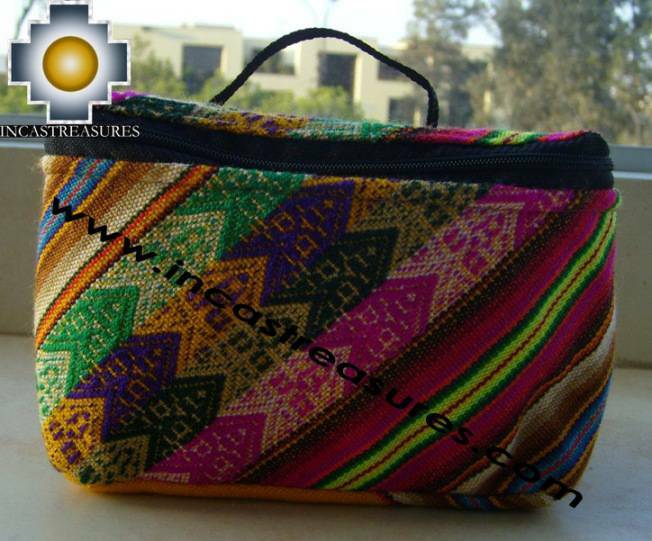 A Dresing case representing the rainbow colors very popular in the Andean Culture. The dressing case is soft. A travel bag can be slung over your shoulder or grabbed by handles. - Each one is totally unique many are totally handmade.